Yesterday evening it was raining. Okay, not raining but it was sprinkling. Living is hot, dry Kaimuki, that is enough for me to call it soup weather. Hey, I take what I can get! After an excursion to the Kapiolani Community College farmers market Saturday morning, I had a big bunch of kale that I still wasn’t quite sure what to do with. Kale chips? Kale salad? Sauteed kale? All sounded tasty but they weren’t exactly what I wanted. Since I had decided it was soup weather, I wanted to make good on my promise to myself and have a big bowl of hearty, soul satisfying soup. Kale and Sausage soup was the verdict. Easy, quick, healthy, and tasty. All the things I look for in a good dinner! *Cooking the sausages in the soup for a few minutes makes them much easier to slice. If you are using a type of sausage that is already firm enough for slicing, skip this step and just add the sliced sausage. 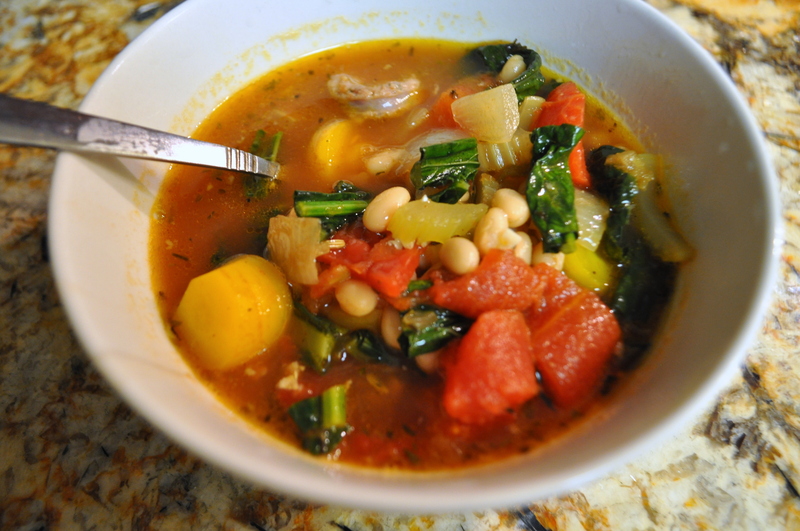 This soup is even better the next day. Make extra for a tasty lunch! Yum looks great! I’m always looking for new ways to use kale. I wil have to save this for next fall/winter!